Discussion in 'In the News' started by xcel, Aug 29, 2017. From the warmest winter across the south and highest Gulf of Mexico surface temperatures on record, this could become the new normal. Texas had gone 8 hurricane seasons without a direct hurricane strike, the second longest hurricane free streak for Texas since the mid-1850s. The current lack of hurricanes is concerning. In particular, the mid Texas coast area around Corpus Christi has gone 45 hurricane seasons without a strike within 50 miles. Through the winter months, the Gulf of Mexico (GOM) surface temps were the highest on record after an extremely warm winter from Corpus Christie, TX to Tampa, FL according to the National Oceanic and Atmosphere Administration (NOAA). For the first time on record, the average GOM sea surface temperature did not fall below 73 degrees through the 2016-2017 winter period. A rule of thumb indicates that surface temps of 80 degrees or above provides enough energy for powerful Hurricanes to form. With the highest winter and spring surface temperatures on record, was this a harbinger of things to come? Just prior to moving into the current June 1 through November 30 Hurricane Season, the GOMs's average surface temperature between June 1 and July 17 were at their warmest for the time period since records began being recorded back in 1982, almost 2 degrees F above normal with coastline temperatures > 85 degrees F and some locations > 90 degrees F! Warmer-than-normal surface temperatures can make hurricanes more intense and in the case of Harvey, the Tropical Storm built to a Category 4 Hurricane with winds between 130 to 156 mph in less than 36-hours. Harvey made landfall at 10 PM CDT Friday August 15, 2017 near Rockport, Texas, with maximum sustained winds of 130 mph. With few steering currents to move Harvey's low-pressure core up towards the Northeast, Hurricane Harvey stalled and in doing so, the warm Gulf temps continued to feed the Hurricane downgraded back to a Tropical Storm moisture had dumped the greatest amount of rain ever recorded from a single tropical storm or hurricane in the continental United States. Just moments ago, Southeast Houston announced that more than 51 inches of rain has fallen in that location from Hurricane turned Tropical Storm Harvey with an additional 6 to 12 inches of rain forecast. The carnage is not over by any means as Harvey headed back out into the Gulf and is scheduled to make landfall for a second time between Beaumont, TX and Lake Charles, LA tomorrow morning. Harvey's rain bands continue to batter Houston as levees never before challenged with this amount of water are being breached threatening America's fourth largest city further. This remains to be written. This is an epic disaster for the people of Houston and other Gulf Coast communities. They desperately need help—both right now and after the waters recede and the news cameras leave. Will you chip in to help the people of Houston? MoveOn will cover the credit card fees, so that 100% of your tax-deductible donation will go directly to local organizations helping people in dire need. Yes, I'll chip in to help provide emergency relief to the people of Houston. Local, community-based organizations do some of the most crucial relief work—providing meals, helping people find health care, distributing supplies, helping residents dig out, and supporting the recovery efforts after media attention has shifted. They're deeply woven into their communities and can help keep them from falling apart under this much stress. We've identified a relief effort that deserves our collective support—the Hurricane Harvey Community Relief Fund, which is spearheaded by the respected group Texas Organizing Project. Will you chip in now? Your tax-deductible contribution will go a long way, and MoveOn will cover 100% of the credit card fees, so that more of your money reaches folks in need. Yes, I'll chip in and help support Hurricane Harvey recovery efforts. In the aftermath of historic natural (and, at times, human-fueled) disasters—from Hurricanes Katrina and Sandy to earthquakes in Haiti and Nepal—MoveOn members have come together as a community to help fund emergency relief. Today, please join me in standing with the brave people of Houston, as they face down a living nightmare. Want to do even more? MoveOn is covering the credit card fees for all donations to the Hurricane Harvey Community Relief Fund from this emergency appeal. Will you chip in a little bit to MoveOn, to help defray those expenses? There have been chemical plant explosions. About 1/3rd of this country's oil refineries have been affected - and may well be offline for a while. There apparently was a level 4 bio hazard lab located in Galveston. There was one case related to chemicals that needed to be kept cool, and power failed in so many ways. Multiple generator backups were submerged. They were just waiting for things to blow in yesterday's report. One aspect I hadn't thought about before is the impact on cars, and especially those left on new car lots. I wouldn't want to see the insurance bill on those alone. Also buyer beware! PaleMelanesian and xcel like this. Beware at the gas pump too-prices are going up quite a bit. Maybe I'll keep the Prius after all. Was hoping for something that could get out of its own way, but this isn't the time. Before you donate to one of the leading "charities" you may want to consider where some of your money goes. Charity Navigator provides useful ratings of how effective charities are and how much of your money goes to actual giving. Right - the Red Cross is essentially a for-profit blood supply company, with a disaster charity tacked on. I was an operational meteorologist at the Brownsville office of the National Weather Service (BRO) in August of 1999 in a somewhat similar scenario. A disorganized area of convection moved off the Yucatan Peninsula into the Gulf of Mexico similar to "Harvey". 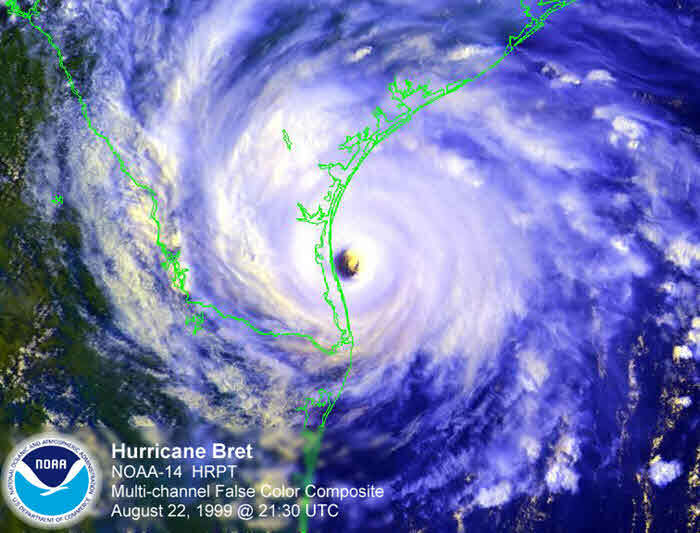 The area of convection quickly organized into a tropical storm before becoming a category 4 strength hurricane ("Bret" - max sustained winds of 145 mph at one point) as it made landfall between Brownsville and Corpus Christi. Fortunately, the direct hit occurred in a sparely populated area of Texas (Kenedy County), so damage was mainly limited to uprooted trees, etc. I remember the models were initially bringing Bret up the mouth of the Rio Grande, which would have devastated Brownsville and surrounding communities. Fortunately, the models were wrong in that case. As I recall, the Gulf of Mexico sea surface temperatures (SST) were as much as two degrees C warmer than normal (warm anomaly) similar to the scenario with Harvey. Even the satellite images looked similar (very well-defined eye). In your experience Just how common is a 50 inches in 6 days rain event on the Gulf Coast? 50 inches is of course a very extreme event. The track of "Harvey" was very unusual. However, according to "Weather Underground" ( https://www.wunderground.com/ ), event total precipitation is not unprecedented. Here is a chart of record rainfall rates as measured over specific periods of time. So according to Weather Underground, a 4-day total of 62" in Hawaii is that record over that period of time. Keep in mind however that a very tiny portion of the earth's surface is actually sampled at any given time. jcp123, PaleMelanesian and xcel like this. Don't know about the coast but 50 inches up where I am (I'm about an hour, give or take, from Andrew, FWIW, and a solid 3-4hr nearly due north of Houston) would be monumental. An inch, maybe 1.25"/hr for a few hours is bad enough. The sandy soil absorbs quickly but gets saturated quickly as well. My back yard is a focal point of neighborhood runoff, so personally 50" would basically cause ruin. Same here with Rita. We had serious wind. This one? Almost nothing. I would be ok from the rain, but my pond is the collection point for the neighborhood. It would likely blow out the dam and cause havoc downstream. Last spring the bridge crossing it a half mile downstream washed out, and that was with inches of rain, not feet. Toyota Motor North America (TMNA) is partnering with Toyota Financial Services (TFS), The Friedkin Group, Gulf States Toyota (GST) and Toyota and Lexus dealers nationwide, to provide a combined relief effort of over $3 million to serve the people impacted by Hurricane Harvey. The group’s relief efforts include funds to organizations such as the St. Bernard Project and American Red Cross, matching contributions, in-kind donations, volunteerism, and the donation of pre-owned vehicles. Dan Friedkin, chairman of GST, has established the Friedkin Disaster Relief Fund and has guaranteed at least $1 million in funding from the Friedkin Family. The Friedkin Group and GST will support Toyota and Lexus dealers, their associates as well as individuals across the region recovering from the hurricane. To make a donation, please go to: Friedkin Disaster Relief Fund. Toyota Financial (TFS) and Lexus Financial Services (LFS) announced the donation of pre-owned Toyota and Lexus cars, SUVs, and trucks to organizations involved in helping move people and property in the recovery efforts. American Red Cross – As a National Responder annual contributor, Toyota supports Red Cross’ ongoing disaster relief efforts across the country, including the Texas coastal region. These efforts include helping secure necessities like food, clothing, prescriptions, etc. St. Bernard Project (SBP) – Provides disaster resilience training and rebuilding in disaster communities, and are currently deploying people in South Texas. Some of the services they provide include: helping victims to negotiate Federal dollars and relief, avoid contractor fraud, and education on mold remediation. In the long-term, they will deploy volunteers and AmeriCorps to rebuild homes at a lower cost. With the implementation of the Toyota Production System, their teams build faster and more cost effectively. SBP’s goal is to help build the capacity of local agencies, non-profits and government by sharing best practices and lessons learned to speed recovery efforts. Toyota will provide an additional donation of $1 million to this project for Hurricane Harvey. TFS/LFS Vehicle Donations – Pre-owned Toyota and Lexus vehicles will be made available to help move people and property as part of the recovery efforts. TMNA/Friedkin Group Dealer Match Program – For Toyota and Lexus dealers who want to contribute to The Friedkin Group Relief Fund, TMNA has set aside up to $250,000 to match Toyota/Lexus dealer contributions. JM Family / Southeast Toyota Distributors (SET) – JM Family, parent company to SET, is making a $100,000 donation to the American Red Cross Disaster Relief Fund. TMNA Dealer Match Program – For Toyota and Lexus dealers who want to contribute to relief efforts and charitable organizations of their choice tied to Hurricane Harvey, TMNA will match their contribution up to $10,000. Toyota Team Member Contributions – Toyota will match all team member contributions throughout the U.S. in support of disaster relief. Evacuee shelters in Dallas – TMNA and TFS is exploring how to engage its Plano-based team members to meet the needs of evacuees – such as clothing, toiletries and/or volunteer support at locations like the Kay Bailey Hutchinson Convention Center in Dallas, Texas. Toyota Motor Manufacturing Texas – While not in the heart of the storm, the San Antonio area sustained high winds and drenching rains from the outer edge of the tropical storm after it made landfall. Team Members at the manufacturing plant are organizing to volunteer in the local community, blood drives, and provide in-kind donations to displaced people. Ford and its dealers acted to aid Hurricane Harvey victims by committing millions of dollars in relief funds and offering special assistance to those who need to replace lost or destroyed vehicles. Existing customers affected by Hurricane Harvey can apply to have their payments deferred for up to two months by contacting Ford Credit or Lincoln Automotive Financial Services online, at Ford Credit or Lincoln Credit, by or phone at 800.723.4016 or by using the FordPass smartphone app. Ford has 114 dealerships in the Houston region. Currently, 101 remain open, 13 are closed and 10 (some open and some closed) have incurred extensive damage. While assessments are still under way, Ford expects dealer vehicle losses to be in the low thousands and isolated to a few dealers. As Texas continues to recover from unprecedented flooding caused by Hurricane Harvey, FCA US LLC and the FCA Foundation have partnered with disaster relief organizations to support residents and communities affected by the storm. The Honda family of companies in the U.S. has pledged $100,000 to the American Red Cross in support of Hurricane Harvey relief efforts. The pledge will consist of a corporate contribution as well as a matching gift program for individual Honda associate contributions. Honda is working with the American Red Cross to establish two websites where associates can contribute via credit card directly to the Red Cross, which will then be matched dollar-for-dollar by the company. These sites are currently under development and will be ready this week. Honda is also inviting its dealers, retirees, suppliers, partners and contingent workforce to join in supporting the Hurricane Harvey relief effort. Honda wants to provide them with an opportunity to join us in the effort to alleviate the suffering of those affected by the storm. These contributions will be accepted at a third website, "Friends of Honda and Acura," which will also be available later this week. These contributions will not be matched by the company. The Hurricane Harvey natural disaster is a changing and dynamic situation, and responders in the area are working to assess needs as they arise. In addition to its pledge of $100,000 made during the ongoing emergency response phase, Honda is working with the American Red Cross and the Federal Emergency Management Agency to assess the need for additional assistance and explore opportunities for Honda to donate products such as generators and water pumps during the ensuing recovery phase. In response to the storm, the American Honda Finance Corp. Central Region office in Dallas is fully engaged in offering loan extensions to those in need of that assistance. They are also significantly curtailing collection activities in the areas, and are working with both our automobile and motorcycle dealerships that are in need of assistance.